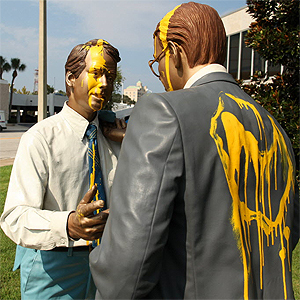 Earlier this week, workers for Paradigm Properties / Collier Companies were shocked to find their bronze statues depicting two business men in suits and ties now covered with yellow paint. The extremely heavy fixture was also found knocked over on it’s side. Statue titled "Let's Just Skip the Meeting"
Gainesville Florida authorities say they are investigating the crime, but have no suspects or leads at this time. Earlier this year, another bronze statue in downtown Gainesville was also vandalized. Somehow, the bronze brief case attached to the downtown monument was removed, which is no easy feat. Collier Companies owns nearly half the rental community in Gainesville, FL. The CEO of the company is Nathan Collier. Collier Companies owns and operates familiar apartment complexes in Gainesville such as The Enclave, Gainesville Place, and Oxford Mannor.